Most of us buy laundry detergent to do one thing, and one thing only. But can it do more than clean your clothes? Should it be working harder for us? The answer is yes, yes it can, and it should. And if you read this, it will. 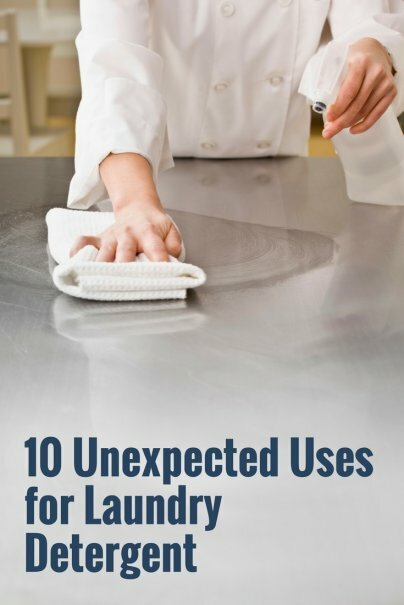 Here are 10 rather unexpected uses for both the liquid and powdered laundry detergents that we all have in our homes. Use them wisely. No matter how many times we wash white pillows, they seem to turn that weird off-white, yellow color. Sure, a good pillowcase can cover it, but we know the truth. If you want to make your pillows look as good as new, follow Jillee's advice: Mix one cup of laundry detergent (liquid or powdered) with one cup of powdered dishwasher soap, one cup of bleach, and ½ cup of borax. The results are stunning. You can purchase products specifically designed to clean up oil spills at home. Some can cost a significant amount of money, such as Ultratech's Ultra-Oil stain remover. However, if you have powdered laundry detergent handy, it can do an excellent job. As WikiHow demonstrates, you simply pour some of the powdered detergent on the stain, followed by a little water. After leaving it overnight, come back and spray the mixture off. The oil spill should be gone, or at the very least, be almost invisible. 3. Make Your Own "Goop"
Mechanics, and people who work with a lot of engines and other dirty products, will know the value of products like Goop and Gojo. They are industrial-strength hand cleaners, designed to cut through grease and grime quickly, whilst leaving your hands soft and without irritation. These are great products to have around if you work with engines and oil often, but for the occasional hand cleaning, mix just one teaspoon of liquid laundry detergent with one teaspoon of vegetable oil and rub vigorously. Then, clean with regular hand soap. The oil should be history. In a spray bottle, mix together liquid laundry detergent with bleach and water. It makes an awesome stove degreaser, especially for those ceramic hobs that catch all the grease splatters. Now, if you're worried about mixing bleach with anything, you're right to be concerned. It's very dangerous to mix bleach with other household chemicals…with one exception. Rick Sachleben of the American Chemical Society assures us it's safe; "Laundry detergent is formulated to be safely mixed with bleach." So, don't worry, it's perfectly safe, and effective. Take a five-gallon jug of warm water and add just ¼ cup of laundry detergent (either liquid or powdered) to it. You now have a large supply of general-purpose household cleaner that is safe to use on sinks, toilets, walls (especially the kids rooms), fire surrounds, countertops, and anything else that needs a good clean. It is much less harsh than other chemical cleaners, and best of all, it doesn't smell. In a previous post, vinegar showed its versatility as a weed killer. Now, it's the turn of powdered laundry detergent. Bring a cup or two of the powder into the yard, and sprinkle it liberally over any moss and weeds that are making your landscaping unsightly. Then, let it go to work. Over the next three to four days, you should see the offending vegetation go from green to brown. Once it has died off, brush it away and then thoroughly rinse the area. There's no denying that drain-cleaning products are great at getting those blockages to dissolve, but we don't always have them on hand. If you have a blockage that needs clearing fast, pour ¼ cup of liquid laundry detergent down the drain, and let it go to work for a few minutes. Then, pour boiling water down the drain. The detergent should have helped loosen up the offending material, and the hot water blasts it free. Kids can quickly turn a beautiful new toy into a filthy, grimy mess. The trouble is, we're often wary about using harsh chemicals on these toys because they are in close contact with the kids' skin, and sometimes mouths. Instead of using harsh, and sometimes dangerous, chemicals, turn to laundry detergent. You can either use some of the all-purpose spray you made earlier, or do a bunch at once by filling the bathtub with warm water and adding a half-cup of liquid laundry detergent. Let them soak, then rinse and dry. They'll be clean, and safe. We often forget how much punishment our decks can take, especially in tough weather. All those dirty shoes and boots, plus the other elements, make decks go from brown to grey in no time. Laundry detergent can help. Tipnut tells us to mix one cup of powdered laundry detergent with ¾ cup of oxygen bleach, and add it to one gallon of warm water. Use a deck brush to scrub the surface, leave for five to 10 minutes, then scrub again. When you rinse it off, the color should be back, and the deck will be looking better than ever. Do you have those pesky soap scum marks around your bathtub, or in the sink? Don't waste time stinking up the bathroom with harsh bleach products. Instead, make yourself a scum fighter with a mixture of powdered laundry detergent and water. You don't need to add much liquid; just enough to work the powder into a spreadable thick paste. Apply it to the soap scum using firm pressure, either in circles or back and forth, then sit back and let it go to work. Then, 20 minutes later, rinse it away with hot water. The scum should be no more. How do you put laundry detergent to work around your house? Laundry soap also works great in carpet cleaners. I use it in my "little green machine" all the time and it doesn't leave residue behind so carpets are softer and the stains don't reappear. 1. "Powdered dishwasher"? Where does one get "powdered dishwasher"? What a hoot. Thanks for the catch! We've fixed this. Interesting stuff, glad I came across this. It'll help me in my business, so I can't wait to make use of it. Thanks for the article, keep up the awesome blog!